Once a news writer, always a news writer. Both my friend and colleague Linda Lau Anusasananan and I are retired from working 9-5 for news and magazine publishers, but we still write regularly. Both of us post blogs—more than one each, still freelance, and we both just published books in the last two months. It was a coincidence that we both wrote independently about our families for future generations. I, on the other hand, started writing the daily news at the Honolulu Advertiser. I moved to Sunset where I swapped my position at the Hawaii field office for six months for one at the Menlo Park headquarters. That is where I learned to write recipes and develop my appreciation and sense of taste for food. Later I wrote news and information about the community colleges of the University of Hawaii. I don’t have vanity plates. 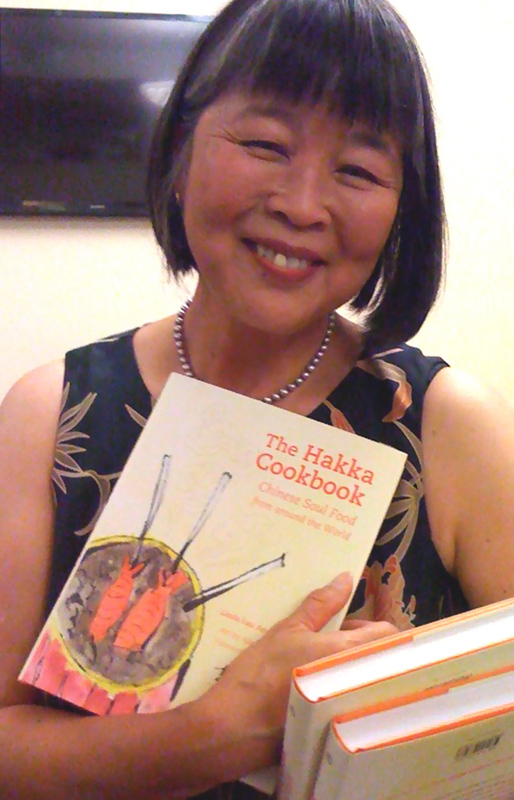 On Sunday Linda flew from California to share her The Hakka Cookbook: Chinese Soul Food from around the World (University of California Press, 2012) with the Chinese Hakka community in Honolulu. It was the day after the official book launch at the Asian Art Museum in San Francisco. It’s the start of her book tour. The Tsung Tsin Association’s Autumn Banquet was an opportunity to provide recipes and cultural information to an ethnic population that craves the food tastes of their childhood. There is no restaurant here that I know of that specializes in Hakka food, but now, someone could open one with Linda’s recipes (hint!). Interestingly, both of us wrote about our “hometown villages” in China, recounting the 2005 trip Linda made to do her research. DH and I joined Linda’s family and, as I’ve mentioned before, enjoyed all the eating. In The Chong Family in a New Millennium, authored by my cousin James H. Kim On Chong-Gossard and edited by Rebekah Luke (Chong Hee Books, 2012), I included the article “A Visit to Our Ancestral Homeland.” This little book is the sequel to Chong-Gossard’s The Chong Family History that chronicles my maternal grandparents’ story from the orphanage in Chong Lok, China, to 1992. Our 2012 book includes genealogy charts, full-color photos of nearly everyone of six generations, unique insights by the author and essays and anecdotes about family from several other cousins. The sure-to-be-a-success recipes in The Hakka Cookbook are interwoven with stories about the recipes, the people who shared them, and Linda’s personal journey to learn about her Chinese roots. To me, I view it as the story of everyone who’s ancestors immigrated. Lucky for Hakka people, Linda’s book documents the experience for future generations. It’s a wonderful read. As I write this, it’s dawn before everyone else is awake, even the dogs and the baby Sofia, and Linda is sitting across the table with her laptop too. We write because we believe it’s important that our children understand where we came from. The ink is in our blood, but rather than write for the government (i.e., public relations), we write what we like. Future generations: Linda’s daughter Lisa and granddaughter Sofia are visiting from California too. Here they are at Kaaawa Beach yesterday.